That’s not quite so crazy. It’s probably still wrong, but not crazy. Kennedy did some popular things, handled the White House with style, and was assassinated before his administration had time to become widely loathed, which it likely would have been had he stayed in office for a full eight years. He never really had a chance to outlast his honeymoon, and LBJ ended up taking the hit for Vietnam and 60s unrest more generally. 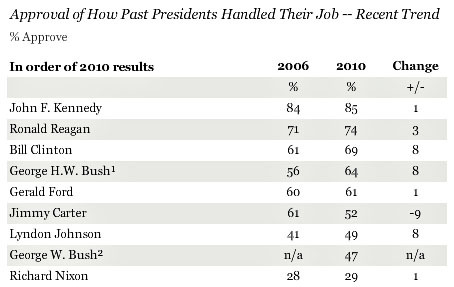 In any case, the innate good sense of the American public is shown by George W. Bush’s low ranking. I just hope that as time goes by, people remember what a bad president he was. He’s not a president who deserves to benefit from the rosiness of faded memories.